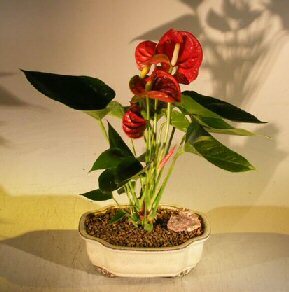 Anthurium is the most popular and long lasting of all tropical flowers. Our premium red Anthurium, from anthos, meaning flower, and oura, meaning tail, refers to the many tiny-like spadix. These bright red colored, heart-shaped, lovable beauties are the most well known all over the world. Our Anthuriums have been specially hybridized for use as houseplants due to their trouble-free growing requirements. With reasonable care your bonsai should last for years. Flowering bonsai tree grown and trained by Bonsai Boy, Currently in bloom.